If you're hankering for a hunk of Fable 2 news, you will want to carve out some internet time for yourself next week, as the official Lionhead Studios blog teases some big-like news. 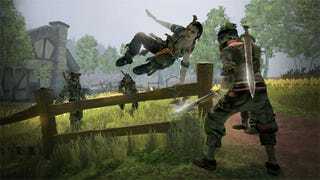 "A lot is happening" writes the official Lionhead dev blog, "if you are anxious to find out something new about Fable 2, I suggest you make sure you've got access to the internet, next week! Yes we are planning something (quite) big-ish." Big-ish, eh? We know it's not the only big-ish thing happening next week, as we expect a respectable number of pre-E3 announcements throughout the week, but we have to wonder what Fable 2 secrets await us. Perhaps we'll see that ballyhooed acorn or learn more about in-game pregnancy! Who wants to make a guess? There's a no-prize in it for you!